Determine Android phone version by going to Home Phone View -> Menu -> Settings -> About phone -> Software information -> Android version. 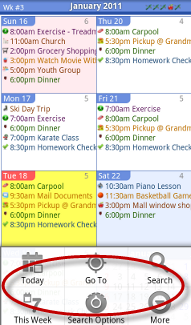 If Android version is 1.5, purchase iRT Calendar for Android 1.5. 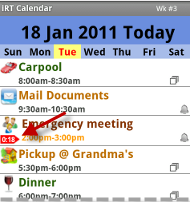 If Android version is 1.6 or higher, purchase iRT Calendar. To purchase iRT Calendar Pro, buy iRT Calendar and iRT Calendar Pro Key. 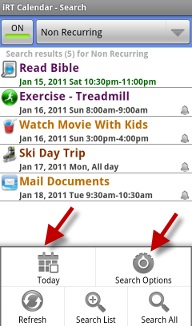 Note: Some of the features presented below are not available on iRT Calendar for Android 1.5. Refer to Product Comparison Chart for details. 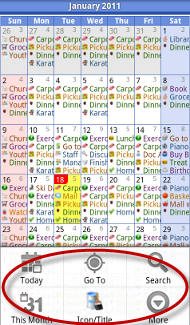 iRT Calendar for Android 1.5 is NOT upgradable to Pro version due to system compatibility issues. 1. Select the Calendar/s you want to use. 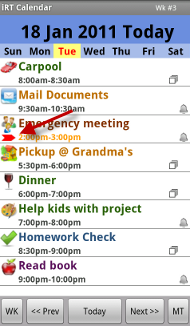 On Day View, go to Menu, tap on More choose Preferences then Calendars to Use, topmost on the list. Calendars to use opens to a list of all Google Calendars available. Uncheck a calendar to hide it. When done, tap on the "back" arrow to go back to Today View. 2. Adding events. Go to Menu, tap on New Event. 3. Adding an Icon. On Day View, long press on an event, select Change Icon, then choose icon. 5. Day View is the default page when opening the application. Long press on any event and the following options are available. Extra Edits will open to a link for the iRT Calendar Pro Key. Edit will edit the event. 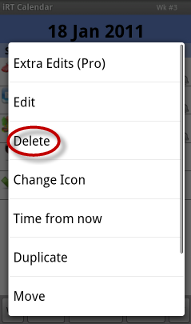 Delete will delete the event/events. For some phones, deleting/updating recurring events has some delay inherent to the way Android Calendar deletes/edits recurring events. The move options do not show for recurring events. Time from now shows time from event to current time displayed in day, hours, and minutes. Duplicate duplicates an event and can be edited to another day or time by going to Edit. 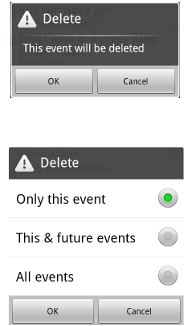 Move moves the event to specific date, only for nonrecurring events. Move to Next day moves the event to the next day. Move to today moves the event to today. 6. 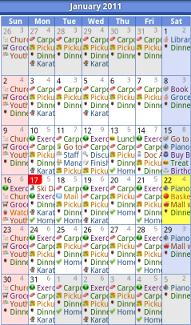 Week View shows all events of a week. Swipe left or swipe right on screen for next screen. Long press on any day to create a new event for that day. Tap on day to go to Day view. Tap on month to go to Month view. Current date is in red, selected day cell is in yellow. 7. Month View shows all events. Swipe on week to go to Week View. Long press on any day to create a new event for that day. Tap on day to go to Day view. Swipe up or swipe down to go to next month or previous month. From the menu, tap on Icon/Title and you can select to display Icon Only, Title Only, or Both Icon and Title. 8. Going to a specific date. On Day View, go to menu and tap Go To. This will open to the Go To View. Select the date. 9. How to backup your event decorators. Event decorators refer to icons and custom colors. 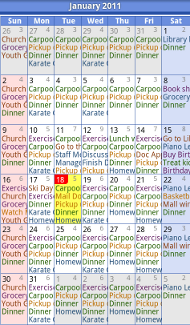 The calendar events are backed up with Google Calendar on the web, not on your phone. From Day/Week/Month Views, go to menu, tap on More. Choose Administer Database, then tap on Backup Database. DAY VIEW IN DETAIL - This section explains the Day view in detail. Reminder icon. Note: This icon appears for any reminder including 0 minutes. (Pro only) Float event icon. Past events when set to float will go to current date until marked as done. Events in the future when set to float will stay in the future until it becomes current. (Pro only) Float recurring event icon. When a recurring event becomes current, it floats until marked as done. On the next occurrence, it will float again. 2. Extra Edits (Pro Only) - long press on an event and choose Extra Edits. Extra edits allows the user to mark event as Done, Highlight, Float. The user has the option to choose font and color but highlight overrides this. Refer to Extra Edits Preferences (Pro Only) on Preferences in Detail for more information. Tapping on the Repeat box saves the Extra edits and goes to the Custom Repeat View. DAY VIEW MENU OPTIONS - the following section will describe the Menu Options in detail. 1. Today goes to Day View with current date. 2. Go To opens a view with a list of months and days. Selecting the month and day goes to selected day. 3. Search goes to Search View. Upon opening the Search View, it displays the result of the saved search parameters - with nonrecurring events as default. As more searches are saved, the last used saved search parameter becomes the default. a. Today goes to the Day View of current date. b. Search Options allows the user to change the parameters of the current saved search. This is the same Search Options view on the main menu. The Search Options brings you to the Search Parameters View. Here the user can create an unlimited number of search parameters assigned to Search Names. By Icon (default is not checked). This will include the icon as part of the search criteria. This is good for birthdays when the birthday cake icon is used. Tap on the icon to select the icon. Start Date defaults to current date and time (default is checked). When the "Default to current date and time" is not checked, the Date can be changed by tapping on it. End Date default to N years. When checked the End Date will be determined by the N years from the Start Date. When the "Default to N years" is not checked, the Date can be changed by tapping on it. Search button/s (button with a magnifying glass and the button with the word: Search) saves the search parameters and starts the search. 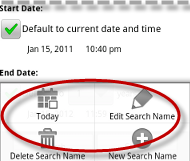 Today goes to Day View of current date , Edit Search Name edits the Search Name, and Delete Search Name deletes the selected Search Name and its parameters. When only one Search Name is left, Delete Search Name option is disabled. New Search Name creates a new set of search parameters with the new search name. c. Refresh refreshes the display according to the saved search parameters. d. Search List enhances the search parameters by dynamically inputing a search string. 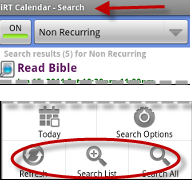 e. Search All searches the events according to the date range specified on the Preference page. 6. More opens to Preferences, Administer Database, Release Notes, and About. a. Preferences - refer to Preferences In Detail below. b. Administer Database same as Administer Database on Preferences. c. Release Notes shows the history of the modifications (versions) of iRT Calendar. The topmost is the release notes for the latest version. d. About shows the description and current version of iRT Calendar. WEEK VIEW MENU OPTIONS - the following section describes the Week View Menu Options in detail. 2. Go To opens a page with a list of months and days. 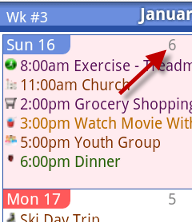 Selecting the month and day goes to the week with selected day highlighted. The Go To can be customized to always go to Day View (instead of Week View) by Menu -> More ->Preferences - check: Go to day always. 3. Search goes to search page. The search option behaves the same way as the Day View Search Option. Note: Long press on any day on the week and it will create a new event. MONTH VIEW MENU Options - the following section describes the Month View Menu Options in detail. 2. Go To opens a page with a list of months and days. 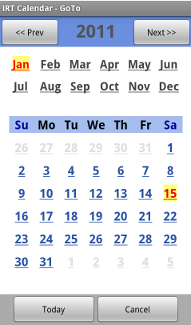 Selecting the month and day goes to the month with selected day highlighted. The Go To can be customized to always go to Day view (instead of month view) by going to Menu - More - Preferences - check: Go to day always. 5. 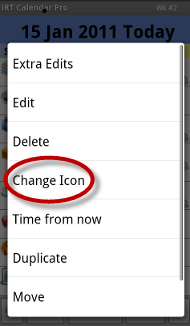 Icon/Tile allows the user to select the display of the month view with Icon only, Title only, or both Icon and Title. Calendars to use opens to a list of all Google Calendars available. Uncheck a calendar to hide. 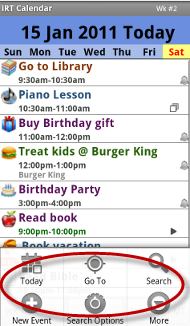 Start Day allows the user to choose the view of the calendar, it can start on a Sunday or Monday. Time format allows the user to select time format as auto, 12 hr or 24 hr format. The auto format uses the system specified time format. 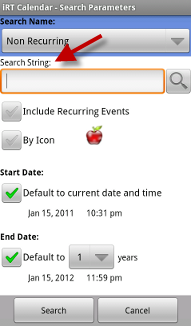 Duration of new events allows the user to select the default duration of every new event. Choices include 5min, 10min, 15 min, 30 min, 45min, and 60min. The default is 60min. 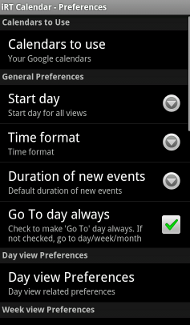 Go to day always when checked, this makes the Go To for Day View, Week View, and Month View always go to the Day View of the selected date. 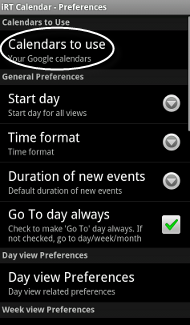 Day View Preferences allows the user to choose the preferences for the Day View. 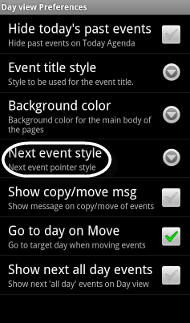 The user can Hide today's past events, choose Event title style to Normal or Bold, choose Background color as white or gray. 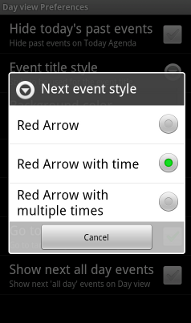 Next event style as red arrow, red arrow with time, or red arrow with multiple times. These are time/s remaining before the event/s is/are due. The user can show or hide Show copy/move message each time an event is moved or copied. The user can set to Go to day view on Move when moving an event with default ON, and can Show next "all day" events or hide them, meaning if the next day is an All day event, the day prior to that day will show an event that says "All day next day". Week View Preferences allows the user to choose preferences for the Week View. The user has the option to Show or Hide event counter. The user can also choose Font size with default size 19. Month view Preferences allows the user to choose preferences for the month view. 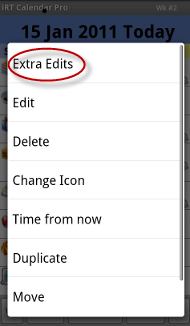 The user has the option to Show or Hide event counter, choose Font size with default size 19, choose icon and title display on the Display icon/event, and the option to Show or Hide month message with default checked. This means that when you first open the month view, a message box will appear on how to use the month view. Selecting "No" to the message will automatically Hide the month message. Extra Edits Preferences (Pro Only) allows the user to choose options for an event's Done display style, an event's Highlight style, and Show custom repeat message. For an event's Done display style, the user can choose to Hide, Strike, or Strike Title only. For an event's Highlight style, the user can choose to highlight background, highlight in red letters, or highlight in bold red letters. The Show custom repeat message's default is checked. This means that when you first open to Extra Edits (when an event is chosen by long press) and press the "Repeat" box, you will see the custom repeat message. Selecting "No" to 'show this message again' will automatically Hide the message. Search Preferences is used for search specific functions. It starts with the Search scope, which allows the user to specify search according to Title, Title and location, or Title, location, and description and defaults to Title Search scope. 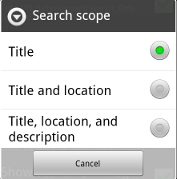 Search will be quicker if Search scope is Title only. 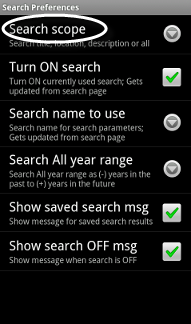 Next is the Turn ON search, which allows the user to turn off the currently used search. This is updated on the Search View. Then Search name to use comes next. It has one saved search default of "Non Recurring." Additional Search names can be added on Search menu -> Search Options View. After that is the Search All year range with the choice to change the +/- years range of the search range. Then the Show saved search message which displays the number of events resulting from a search. Lastly, the Show search OFF message which displays a message that the search is off with default on. On System Preference, the user has the option to enable or disable caching of data. Caching of data allows faster display of events. The default of this is on. The All day offset allows the user to make the all day event offset by +1 day, 0, or -1 day. Some devices, like the htc Droid Incredible offsets all day events 1 day late. To correct this, set All day offset to +1 day. The Screen size allows the user to customize the screen according to their device. This defaults to "Auto." On this page also displays the information on Calendar Version, Floating events last run date, and Event decorator status. Widget Default View allows the user to choose the default view for the iRT Widget. Choices are Day View, Week View, and Month View. Label changes to iRT Day, iRT Week or iRT Month depending on what you choose. Next Event Widget Preferences this is for the the Next Event widget. The user has the option to choose the Time remaining format. 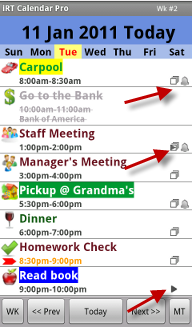 This shows three choices for the next event that has an active reminder. The default is "hrs min (hrs min)" for the "Reminder (Event)." Reminder shows the time remaining for the next reminder, while the Event shows the time remaining for the actual next event. 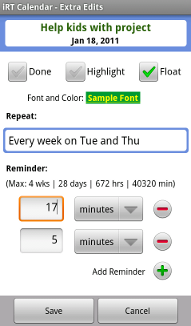 Time and Title format is also used for the Next Event widget. It dictates the time format of the Time and Title display of the event. The default is "hh:mmaa - hh:mmaa title," for example "03:30pm - 04:30pm Shop for Android apps". Create Extra Backup allows the user to create extra backup for event decorators. To create backup refer to Basic Use 9. How to Backup your event decorators. To create extra backup of the event decorators, enable this preference. Administer Database allows the user to administer database. The user can backup database, restore database, or synchronize icons. Database refers to the event decorators like icons and custom colors. 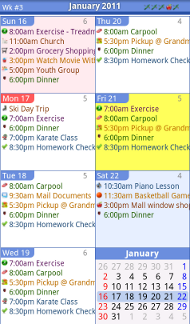 The calendar events are backed up with Google Calendar on the web, not on your phone. Backup Database saves the event decorators. Restore Database is used when the user changes phone, or uninstalls the application. 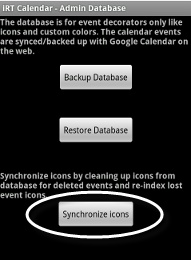 Synchronize Icons cleans up unused icons and re-index lost event decorators like icons, highlights, font colors/background, etc. This is useful in the rare case where Google changes the index of your events on Google web and temporarily "blanks" out your phone. When the calendar comes up, the decorators (icons and etc) are gone. This means that the indexing of the events and decorators are not synchronized. Synchronize Icons fixes this. Help links the user to the iRT Calendar website. There are three basic modes of search: Saved Search, Search List, and Search All. Saved Search is when the user can enter search parameters and assign them to search names. On Search View, click menu and choose Search Options. This will open up Search Parameters. In the Search Parameters View, different filters can be applied. To save the search parameters and start searching, click on the search image button or Search button, or click on Cancel to abort saving. While in the Search Parameters View, the user can tap on menu to edit, delete, or create a new set of Search Parameters. For Search List: While on Search view, click menu and choose Search List. This will use the saved search parameters described above but override the Search String portion, thus allowing the user to do different search strings for the currently used search parameters (saved search). Search All will search all searches +/- years of events. The search parameters are specified on the Preference. This can be set by gong to Day view -> More - > Preference -> Search Preferences -> Search All year range. The default is +/- 2 years. Other search preferences can be set on Day view -> More Preference -> Search Preferences. I can't figure out how to save searches with a different name than nonrecurring events. Could you pls explain how to do this? Common searches like search for nonrecurring events, or search for birthdays, or bills, would all be saved with their respective search names. The default saved search is nonrecurring events which is the only option you would see when you go to Search View. If you want to search for Birthdays, you would go to Menu -> Search Options -> Menu ->Search String Box. You would enter the new search name on the Search String box. You would type Birthday to search for Birthdays, then tap on Include recurring events then select a Birthday icon by tapping on the apple icon. These parameters will be included on the new search. The start and end years' default is one year but can be changed using the drop down menu for years. Then tap Search or the magnifying lens button. This will save the new search name and start the search for Birthdays. Now on the Search View you will see two saved searches -- the non recurring and the newly created Birthday, select any and it will use the saved parameters attached to it for search. You can add more like bills, or if you are working PTO or Time Off. Then when you go back to the Search View you would see three options. There is no limit to the number of saved search that you can create. It is an easy way of going back to the different types of searches that you would normally do. Note that each saved search name have their own saved parameters -- nonrecurring will have whatever was set ; birthday will have it's own set of parameters; bills will have it's own set and so on. Search List (Search View -> Menu -> Search List) is just using the currently selected saved search and using a new search string instead of the saved search string, thus you can refine further your saved search. For example the saved search nonrecurring would show you different types of meetings for the year which could be many, you can narrow down the nonrecurring by typing specific string to the Search List and you would see fewer results. Search All (Search View -> Menu -> Search All) is not tied to Saved Search or Search List. The search all searches +/- years of events specified on the preference (Day view -> More - > Preference -> Search Preferences -> Search All year range. The default is +/- 2 years. Other search preferences can be set on Day view -> More Preference -> Search Preferences.